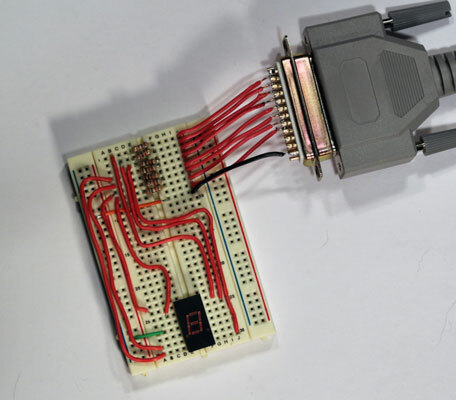 This electronics project presents a breadboard circuit that connects a seven-segment display to seven of the eight output pins of a parallel port. You need a computer with a parallel port and the Kit 74 software installed. 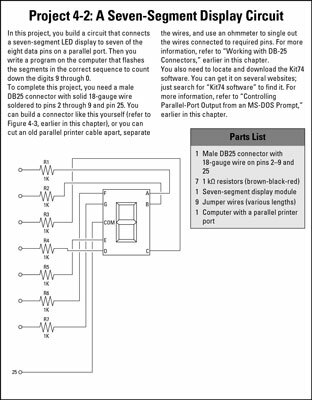 You also need a parallel-port connector with wires soldered to the data pins and one of the common data ground pins. All seven of the display’s segments should light up. If one doesn’t light, carefully double-check your wiring. 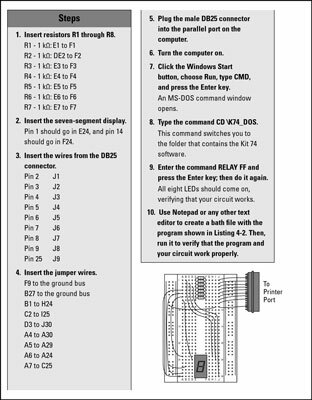 Also verify that your seven-segment display uses the same pinouts as the one listed in the project; some display modules have different packaging with different pin connections. Finally, remember that you may have to run the RELAY command twice to get it to work. When the circuit checks out, run the COUNTDOWN.BAT script. The seven-segment display should count down the digits 9 through 0 at 1-second intervals. When it gets to zero, the display should flash until you terminate the batch file by pressing Ctrl+C or closing the command window. The finished parallel-port seven-segment display.